War! What is it good for? Absolutely something, according to Hans Jacob Orning and Jón Viðar Sigurðsson, professors of history at the University of Oslo. Conflicts can be a sign of competition between productive countries, or an indication that a government has a tenuous grasp on power, they point out. Orning and Sigurðsson plan to study Nordic civil wars that took place between 1100-1300 and contemporary conflicts from a comparative perspective during a year-long residency at the Centre for Advanced Study. Their research group, featuring scholars in the humanities and social sciences from Norway, Denmark, Sweden, Germany, the United Kingdom, and the United States, is one of three hosted at CAS during the 2017-18 academic year, the centre’s 25th anniversary. Read more about the project, The Nordic 'Civil Wars' in the High Middle Ages in a Comparative Perspective, here. 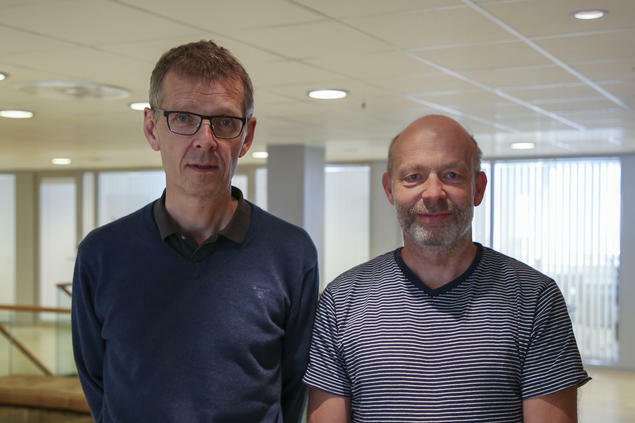 Orning and Sigurðsson have a busy year ahead of them – their group has plans to first develop a theoretical framework to guide their research, and from there write three anthologies. They sat down shortly after arriving at CAS to discuss their plans. JV: Wars and civil wars have been a part of humanity since we first began walking the earth. Peace, in some sense, is an exception. HJ: We tend to think that conflict is a sign of a society in crisis – that something isn’t working. That line of thinking can easily become anachronistic, because conflict, historically speaking, can be highly productive. Take Europe – what made it such a hub of activity during the Middle Ages compared to the rest of the world was in many ways the fact that you had competition between kingdoms. We’re medieval historians, and we’ve been working in this field for years. We were looking for ways to gain a new perspective, and that’s when we thought about looking at the civil wars we’ve seen during the modern era. JV: We’ve decided to do two things – first of all, compare Nordic and European civil wars during the 1100-1300s, and second, compare those Nordic civil wars to today’s conflicts. JV: This is going to be a demanding year. CAS is the perfect place for a project of this scope. Since we’re associated with a Norwegian university, we’re automatically on sabbatical. At the same time, we’re able to invite top scholars from around the world to come and work with us. Nothing in Norway compares to CAS. HJ: You need space and time to do innovative research. If you’re tasked with doing something you’ve never done before, you can’t just set aside a day or two a week to work on it. Simply put, you need time. That’s what’s so great about being here. HJ: What’s exciting – and a little frightening – about fundamental research is that you don’t exactly know where you’ll end up. Once we get a chance to sit down with the other fellows, we’re hoping that we’ll be able to do something innovative, but we really don’t know what that will look like. We’re all stepping out of our comfort zones. But in order to do groundbreaking research, you have to go through an initial chaotic phase. JV: That’s why these conversations with scholars from so many different disciplines are so important. The opportunity to sit down with fellow scholars on a daily basis to exchange information and knowledge with them, and through those conversations create new knowledge – it’s just fantastic. When we go back to campus in a year, we’ll be equipped with all kinds of new knowledge, which we can then pass on to our students. I think people sometimes underestimate that benefit of a year at CAS. Obviously the scholars will end up learning a lot, but those insights will be passed on to students as well.